Hi all! I haven't posted on here yet but here it goes. 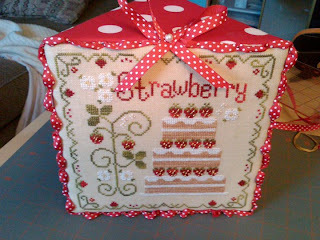 :) I stitched up the model Strawberry Cake by CCN for Crescent Colours and finished it up for them. We decided on making it into a cube shaped like a slice of cake. This isn't the best picture, hopefully Sharon will have some better pictures from Market when she gets back. But you get the idea. Sure I will stitch all of them ! Very cute! Thanks for sharing your finished piece. It makes me want this series even more! wow!! so sweet!! )))) very cute! it's wonderful! I love how you finish it!